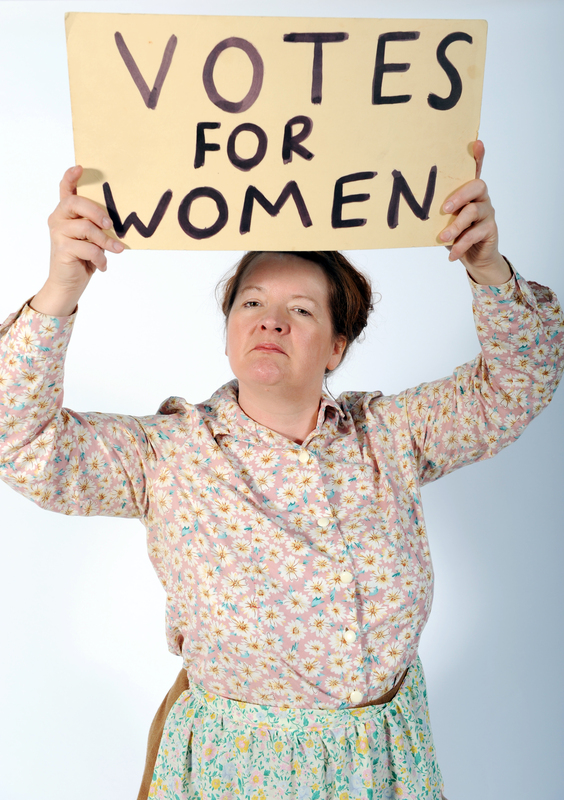 What if….the suffragettes didn’t get the vote? On Thursday 15 May, the PHM will explore alternative histories for Museums at Night. Join our hypothetical tour guides as they weave tall tales and ask you to imagine infinite possibilities of what might have been. In a series of blog posts before the event we’ll be featuring questions so you can swot up on your hypothetical history and add your own alternatives. On the night we’ll subvert our timeline with your suggestions. 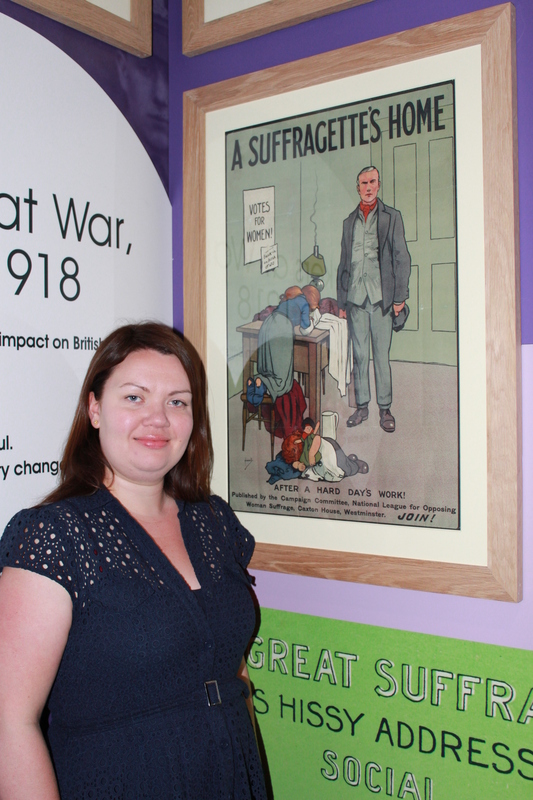 In the first blog, our Head of Collections and Engagement, Louise Sutherland asks What if… the suffragettes didn’t get the vote? We’ve all heard the word Suffragette, most of us know that it’s primarily about women and their fight to get the vote and some of us will know that most UK based suffragette activity took place before World War I. There is a fair bit of talk about 2018 at the moment and its place within British democratic history, not least through PHM’s Wonder Women programme. In 2018 it will be 100 years since women over 30, who fulfilled certain criteria, were eligible to vote. Full enfranchisement on equal terms with men took another 10 years to 1928 and the voting age was lowered to all adults over the age of 21. What if… this cat didn’t get to wear this incredible hat? In February 1918, the Representation of the People Act (or the Fourth Reform Act) was passed through British Parliament. It gave voting rights to men (all men, regardless of background) as long as they were over the age of 21 and resident in their constituency. Women over 30 now qualified to vote, but additionally they had to meet one of the following specific conditions; that they were either a member, or married to a member of the Local Government Register, a property owner or a graduate voting in a university constituency. At this point women now accounted for 43% of the voting electorate. The national women’s suffrage movement started with the formation of National Society for Women’s Suffrage in 1872; clearly activities and groups existed before this, women had been excluded from voting in the Great Reform Act in 1832, but this is the campaign really making its mark on the national stage. 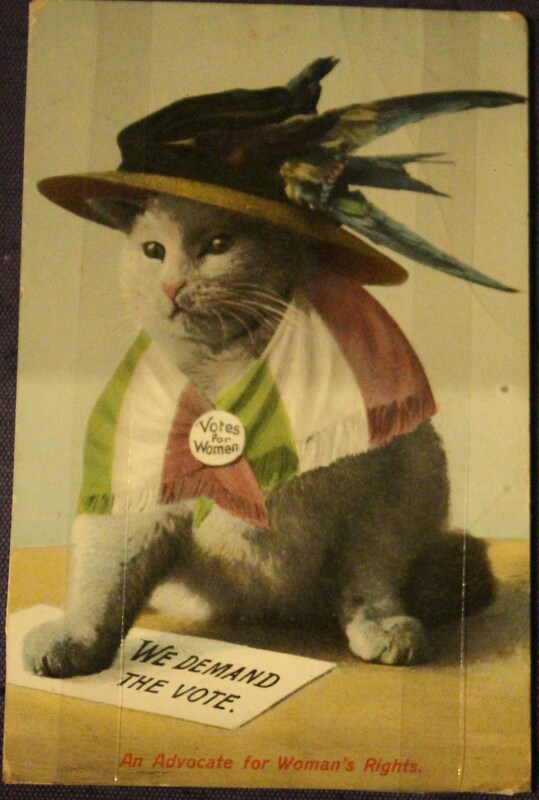 Early campaigning was on the whole peaceful and the militant tactics that many suffragettes are remembered for coincided with the formation of the Women’s Social and Political Union in 1905. Hunger strikes occurred from 1909 onwards and Emily Wilding Davison’s death at Epsom took place in June 1913. What if the suffragettes had not be partially enfranchised in 1918? What if they were still vote-less? What if there had been a return to the militant tactics seen before the war? What if tactics became even more militant? What would the more pacifist arms of the movement have done? What could this have looked like? How would this have affected Britain? Most suffragette campaigning stopped at the outbreak of war in 1914. In 1918 following peace there were more women in the country than men as a direct consequence of the war. Women’s networks still existed and the mothballed coordinated approach so expertly managed by the different societies would have been easy to kick-start again. The frustration at being unable to vote, coupled with the successes of the franchise campaign in other countries, would have been a bitter pill to swallow. What do you think would have happened? How you have felt as a member of one of these women’s organisations and your demands for the vote had gone unanswered? What would you have done? 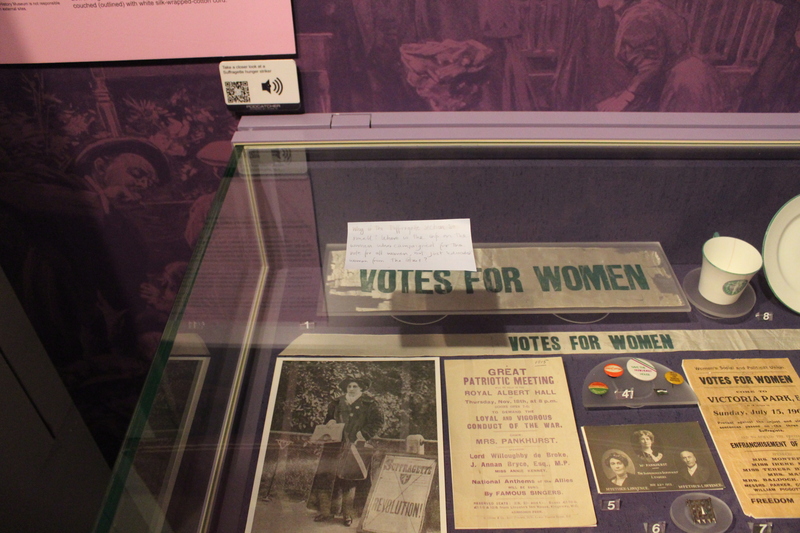 Ask a Curator: Why is the suffragette section so small? In a recent experiment to gather people’s thoughts and questions on PHM’s galleries, one visitor asked two questions. The first was Why is the suffragette section so small? And the second Where is the info on the women who campaigned for the vote for all women, not just ‘educated’ women from the start? Here is my response. I’m going to attempt to answer your query. But I should warn you that PHM is a museum of politics and debate. In this spirit I should state that don’t entirely agree with the premise of your question. Relative to the rest of the gallery I don’t agree that the suffrage display is that small. In terms of floor area its one of the largest, although I’ll admit it would be better if it were bigger (but I’d say that about much of the sections of the galleries). To some extent all the displays reflects the size of the collection. As a museum our uniqueness, our USP, is the stuff. Often it was objects that drove the decision making about the relative size of displays. The suffragette collection at PHM is probably one of the largest of its type in the UK (the Museum of London and obviously the Women’s Library also in London can count larger examples). Despite this, other collections at PHM dwarf it, the examples of posters and the banner collection spring to mind. Suffragette material is highly coveted by public institutions and private collectors alike, acquiring more of it is very difficult (though we would like too). Given the size then of the collection what with the objects and the recreation of leading Suffragette Hannah Mitchell’s kitchen, I’d say the display is relatively large. I’d also like to say that I think the museum’s focus on the suffragettes goes beyond the story of ‘rich women’. 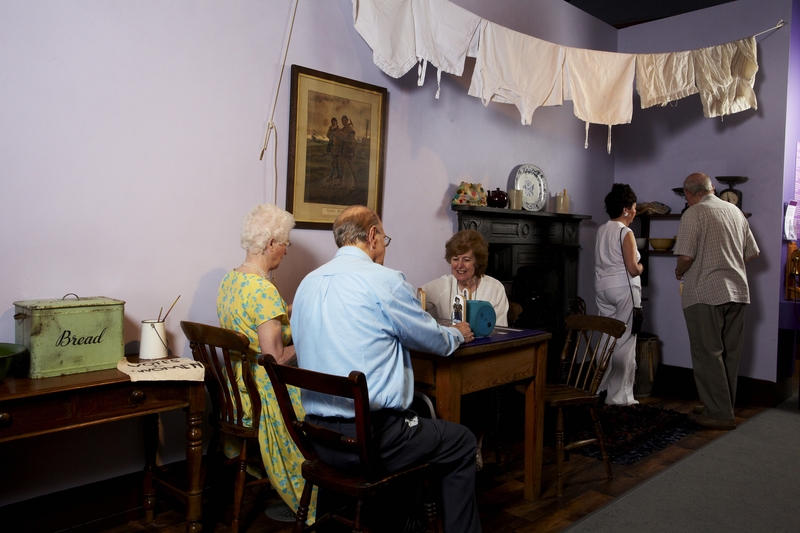 As stated the kitchen is a recreation of Hannah Mitchell’s who was a working class woman from Derbyshire who lived in Bolton and Manchester. We also have the arrest warrant of Leeds suffragette Alice Noble a 17 year old working class woman arrested on a march in London and sent to Holloway. Moreover, the museum’s ‘displays’ move beyond the physical. We host a yearly festival called ‘Wonder Women’ which has events, conferences, art instillations etc which highlight women’s fight for the vote. The museum also has a ‘living history’ character which brings to life for school groups the story of afore mentioned working class suffragette Hannah Mitchell. Does this sound defensive? It’s not meant to. Because I do think there are some problems with the display as it stands. That gap between 1918 when women aged 30 and over were included in the franchise (I’m avoiding the word given, far too patronising) and the equal franchise act in 1928 is almost entirely absent from the gallery. Bearing in mind this was a time when there a significant campaign to end the discriminatory age bar for women, we do need to say more. And to be honest, the act itself, that seminal moment when women and men could vote on equal terms is also not properly recognised. Every time I give a tour of the galleries, I emphasise that crucial point, and yet not everyone who visits can make the tour. To finish I’d like to say that of course there is mention of the famous women of the suffrage movement; the Pankhursts and Emily Wilding Davison’s. Though I feel we’d get complaints if there were not. And we recognise that there were thousands of women (and men) who campaigned for suffrage. Of them nothing survives, not even a name. How then to recognise those women? I’d like to think that in some ways the museum is a memorial (is the right word?) to them, but perhaps we need more. 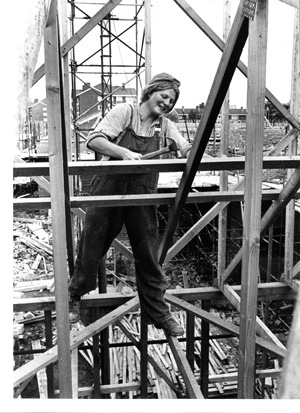 When working on the new museum we had the same problem with the display on sweated labourers; women who worked horrendous hours for criminally low pay. The same for the account of match girls strike, of which there are no objects. There is a display to both and an interactive which (we hope) helps people empathise with their plight. But ultimately the museum is one of the poor, the unrecognised, and the underrepresented. These people did not necessarily own much. At which point the obvious question arises: how do museums whose very foundation is built on objects of the past, tell the lifes of those whose history is not expressed through material possessions, but through ideas, through fights and above all through hope? In part, I hope, it’s by having these discussions with our visitors.